#TBT to the June 1954 F&SF and this Kirberger cover illustrating Heinlein’s serialization of The Star Beast. This issue has part 2 of 3 of Heinlein’s novel about a high school boy with an extraterrestrial pet; in F&SF it was called Star Lummox. The other standout story in the issue is Andre Norton’s “Mousetrap,” a story about sand sculptures on Mars. Norton’s story has been reprinted many times, beginning with Dikty’s Best Science Fiction Stories and Novels: 1955. “Mousetrap” was also included in SFWA Grand Masters Vol. 2, The Prentice Hall Anthology of Science Fiction and Fantasy, and many Norton collections. The rest of the issue includes a mix of famous names and newcomers, just like you expect in F&SF. Overall it leans slightly toward sf over fantasy. “Heirs Apparent” by Robert Abernathy is an atomic age end-of-the-world story about a face-off between the last Communist and last Capitalist. “Heirs Apparent” was also included in the Ditky Best SF 1955 anthology with Andre Norton’s story, and was reprinted in many other anthologies. Abernathy’s social commentary is followed by Gordon R. Dickson’s humorous “Miss Prinks,” which was included in his collection Mutants. “Time Payment” by Michael Shaara is a time travel story with a mystery: why does no one ever return from the future? Shaara is famous as the Pulitzer Prize-winning author of the Civil War novel The Killer Angels, but started out writing science fiction. The issue also features two new writers, one not really new and one who didn’t publish again. “Warrior in Darkness” is by the new writer “Levi Crow,” a pseudonym created by Manly Wade Wellman for several fantasy stories he published in F&SF. And near the end of the issue we have “Mint, in d/j” by Ruth Laura Wainwright, a mysterious author who only published one other story in Galaxy in 1953. Her work is reminiscent of other women who published only a few stories in the 1950s: smart and feminist, more promising than polished, and you have to wonder what happened to her and her writing. You’re left wondering what kind of writer she might have become if she had continued to publish. 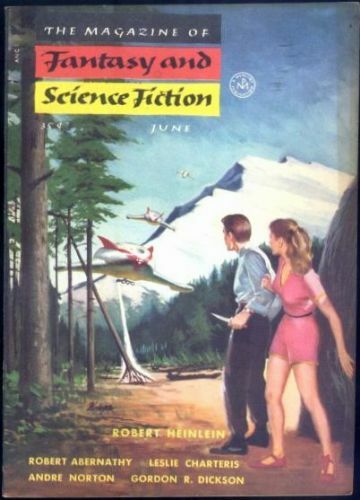 Like many early issues of F&SF, the issue includes two reprints, “Fish Story” by Leslie Charteris and “Visitors from Venus” by T.S. Watt. Plus a book review column by the editors, Anthony Boucher and J. Francis McComas. All in all, a good weekend’s reading for early summer in 1954.